The bizarre story of a censored Israeli military academy video showing uniformed IDF soldiers singing a Persian language love song became public earlier this month, but takes on more significance in light of this week's missile exchange between Israel and allies Syria and Iran. One week prior to last Thursday's military escalation which started in the Golan but ended with Israel launching a massive missile attack on Damascus, the video of a performance by about 50 new graduates of an Israeli military intelligence language course appeared on Israeli social media, a course wherein Israeli Defense Forces personnel learn Farsi (or alternately called Persian). Notably, it was released the same week Israeli Prime Minister Benjamin Netanyahu accused Iran of lying about its nuclear program in a live broadcast, which precipitated President Trump's pulling the US out of the Iran nuclear deal. Was the "leaked" video a provocative stunt meant to mock and taunt the Iranians? Still frame of the illegally uploaded IDF footage. Israeli censors quickly tried to remove it, but not before it went viral. 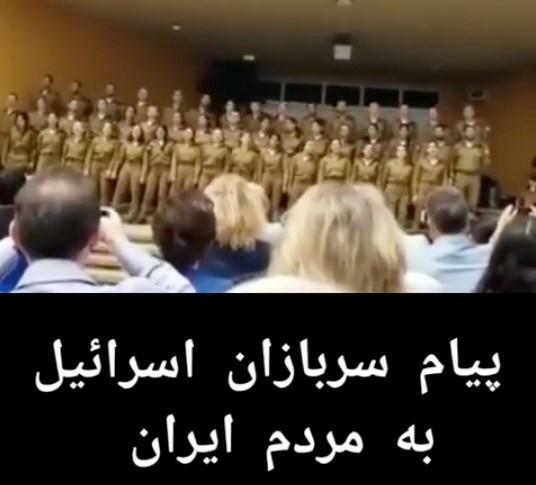 The Persian song, "Sultan of Hearts" was sung by the trainees in a ceremony at an army base, and a parent in the audience subsequently uploaded video to social media. As the folk song is very well-known in Iran, the video quickly went viral through Iranian social media and across the Middle East before being picked up by Israel's Channel 10 news; however the original poster since removed it after Israeli authorities ordered it be taken down as it was filmed at a sensitive location. The odd video showing intelligence soldiers singing in Farsi in front of a large audience evoked different reactions on Middle East social media — some interpreted it at the time as an extension of peace, while others saw it as a strange PR stunt meant to taunt Iran in the midst of ongoing Israeli threats. Or it could simply be a display of the new course graduates' language skills captured in an ill-timed video. Regardless, the video's rapid spread on the internet has produced blow-back for the Israelis. The lyrics include lines such as: “With beautiful love, the world is very small. I’m with the memory of you everywhere, everywhere, so I don’t abandon you,” and further, "You are the king of my heart, You've broken the gates of my heart, You've pledged your heart to mine, You joined me, One heart says, 'go, go,' My other heart says, 'don't go, don't go,' What will I do without you?" — according to a partial translation by Iranian scholar Reza Akbari. 50 uniformed IDF soldiers sing "Soltane Ghalbha" (Sultan of Hearts) at a ceremony. The video was illegally uploaded by a father in attendance. Twitter users in Iran were conflicted over the video, with some seeing it as further evidence of how good Israeli intelligence may be, while others saw hopes for peace in the choice of the love song. The video was shared only a few days after Prime Minister Benjamin Netanyahu revealed a massive Israeli undercover operation carried out in Tehran, in which the Mossad managed to remove tons of paper and digital files on Iran’s clandestine nuclear weapons program out of the Islamic Republic. Whether it was an "intentional leak" or just a casual and fluke incident, one aspect which hasn't been discussed is the fact that the video provides close-up facial footage of Israeli intelligence operatives. Likely this is why the Israeli military command quickly tried to remove the online video, though it was too little too late. Middle East analyst and Iran specialist Holly Dagres explained that, "the soldiers are part of Israel's intelligence unit focusing on Iran." Halfway through the one minute video dozens of the singing soldiers' faces are zoomed in on. Considering that these new graduates are potential elite intel officers related to Israel's Iranian intelligence collection team, it appears their cover is now blown for all possible future covert operations. Like the US military, there is often a revolving door of experienced personnel shared between the military and more elite Mossad and other intelligence branches (similar to the way many career CIA and NSA officers are former military). Both the Mossad and IDF frequently conduct high-risk intelligence operations abroad related to Iranian assets and targets, and as we've reported this week, no less than the commander of the National Guard himself is now a target of Israeli covert assassination plans. No doubt, the Iranians are likely studying the identities of those soldiers who appear in the video very carefully.